For a great understanding of George's early life, his reminiscences are required reading. I will only give a summary here. George was born in Kells, County Meath, in Ireland. 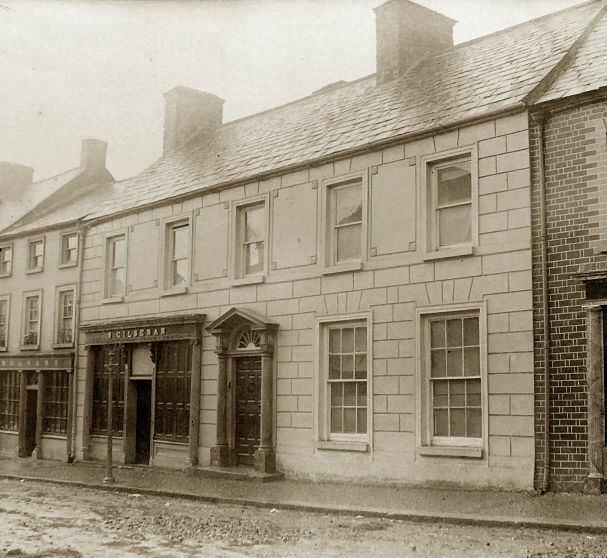 His parents had moved to Kells after they were married and lived in what was probably his great grandfather Walter Keating's house on Market Street. George calls this his birthplace. The former Walter Keating family home on Market Street, Kells, where George was born. Walter Keating was a prominent merchant in Kells, and George's father seems to have taken over some of his business interests. George's brother James chose the ministry, but George worked with his father tending to their various income-producing ventures, primarily their cloth store and the management of farms they sub-leased to tenants. The Smiths were, in turn, lessees of the Marquis of Headfort. A cluster of disasters in Ireland changed the Smith's circumstances drastically. The economy, the potato blight and livestock disease threatened to ruin the family. Dewitt Clinton, governor of New York and Jane (Keating) Smith's first cousin by marriage, convinced George's father to move to the United States in the 1820s, but he reversed the decision on the advice of friends. 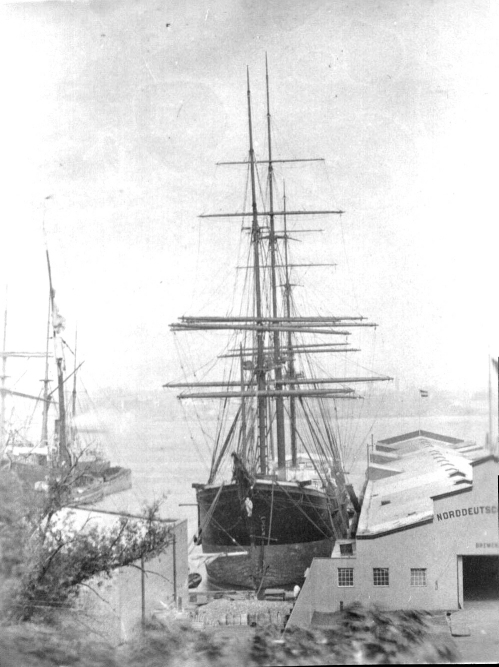 With assets that gave them a very comfortable life nearly gone, George, who had taken over the family's financial concerns, sold everything they owned, which was mostly the leases and some livestock, and they all got on the ship Caleb Grimshaw to sail on 3 August 1848 for New York City. George may have gotten to know the captain well enough to tell him the about the diminishment of their life in Kells. He copied some paperwork for the captain during the voyage, undoubtedly for money, and the captain invited him, if not the rest of the family also, to eat with him. They arrived on the 11th of September. Captain William Hoxie's commission on Caleb Grimshaw came to a terrible end several months later. On the next return trip from Liverpool the ship caught fire and sank with the loss of about a fifth of the passengers. Hoxie left the ship on one of the life boats, and he was vilified for it. The Smiths were advised to go to Ohio if they wanted to farm. They traveled by train to Philadelphia, then out to the Allegheny Mountains where they connected to the ingenious "inclined-plane" canal to Pittsburgh, then by steamboat to Cincinnati. Oral history is quiet about what occupied the family in Cincinnati. The 1850 census says that John B. Smith was a merchant and George was a clerk. John was undoubtedly retired from active business, as he had been in the later years in Kells. The 1850 directory for Cincinnati lists George K. Smith with a lumberyard in the northwest part of the city and a residence on Ninth Street. Oral history in the family of George's sister Lucie also says he had a lumberyard and that it was next to the Procter & Gamble soap factory. George supposedly became the superintendant of the factory. This connection to Procter & Gamble hasn't been confirmed, and if it happened, it was brief. George's mother mentions getting a visit from Mrs. Gamble many years later, suggesting some sort of relationship between the families. Later directories all say George was a bookkeeper for various firms including The Citizens Bank and a dry goods company. For several years before the family moved away from the area he worked for an imported hardware firm at 53 West Pearl Street, run by partners Robert Gasten and John D. Dickson. They would factor again in his life after he moved. George signed a letter in November 1853 recommending several bookkeeping books by J. C. Smith, which was published in Smith's Ready Reckoner. George met Anna Gooch at St. John's Episcopal Church - he was a Sunday School teacher, she was in the choir - according to Gig Wister. When they married George was living on Longworth Street. Not long after they they moved to Covington, Kentucky, across the river from Cincinnati. 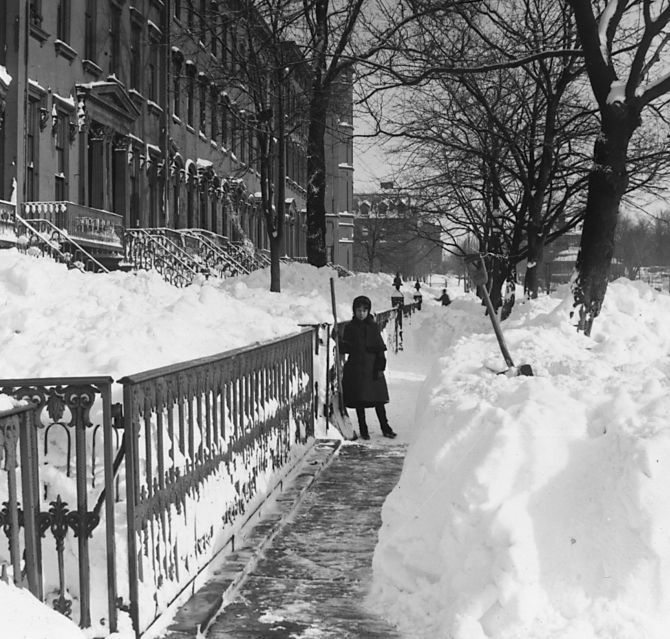 Something led the family to move to Brooklyn, New York, several years later. 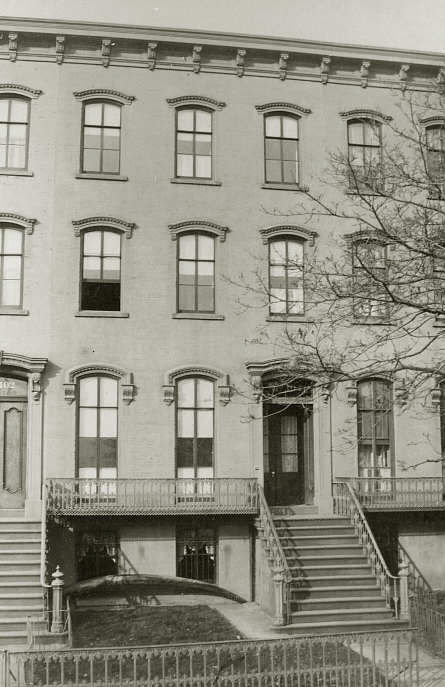 About 1864 he and his brother-in-law Edwin Mason, a hat retailer in Cincinnati, took their families to what is now the Beford-Stuyvesant neighborhood to open a hat store at 743 Myrtle Avenue. 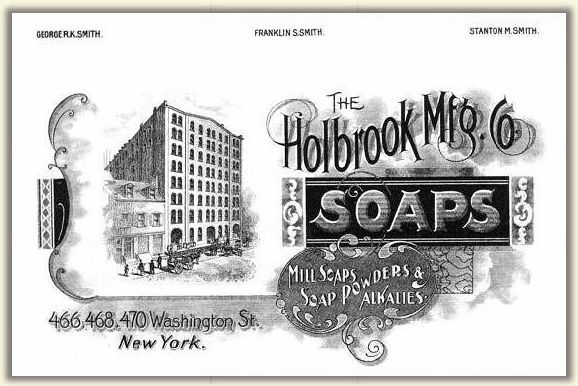 That lasted several years and in 1867 George became a partner in the Holbrook Manufacturing Company, makers of industrial soaps. Getting involved in the soap business adds another bit of credence to the story that George worked for Proctor & Gamble in some way. Robert Gasten and John Dickson later joined him as partners. There were close bonds among some of this group. 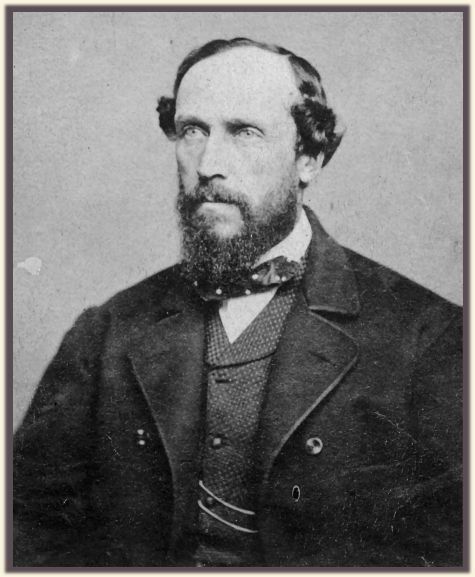 George's nephew Edwin Charles Mason was hired as a salesman for the company by 1900, and he gave one of his sons the middle name Gasten. George had initially intended to give his son Robert that middle name, but it was given up in favor of Keating. The family lived in a Gothic Revival cottage on Hart Street. This is where George's father died. It was during their residence in Brooklyn that George designed a medieval looking method of protecting wagons, which he patented in 1868. It's not surprising that the idea didn't catch on. Anna (Gooch) Smith, George's wife, was never satisfied with the minister or the services held in any of the churches they attended. She apparently was obsessive about it and caused the family to move every couple of years in search of her ideal place of worship. In the mean time George had finally found a business to hang his hat on. 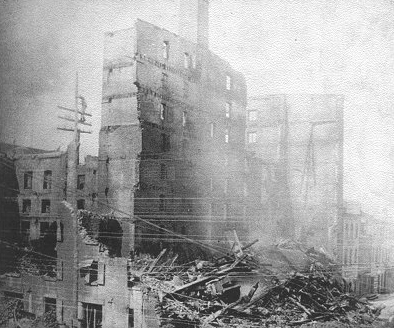 The factory eventually located on Washington Street in Manhattan, where it suffered a spectacular fire in 1882. 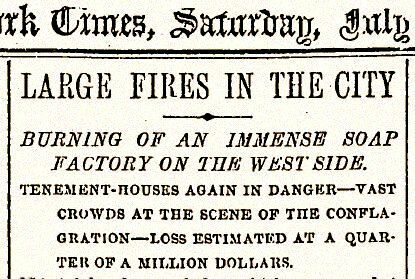 George reportedly arrived at the scene of the building reduced to rubble and said, simply, "bully of a fire." The New York Times reported on the event. 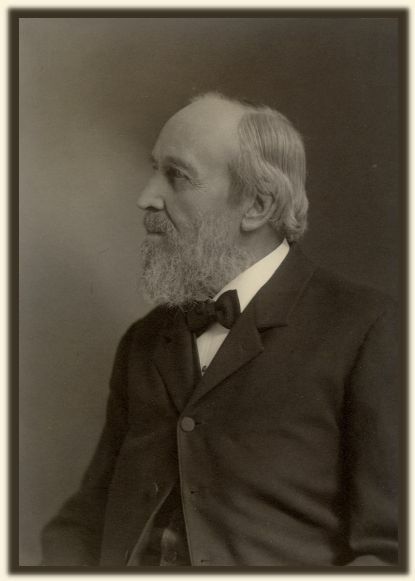 courtesy of Douglas C. Wendell, Jr.
By 1881 George was Secretary of the company and Treasurer by 1885. They moved to new quarters further north on Washington Street after the fire. Here they remained for about 30 years. F. S. "Stod" Smith II had several recollections about going to and being in this building, with its flickering gas lights. The old photo clearly was given to the letterhead engraver to use. After Brooklyn, the Smiths were in Jersey City, Yonkers (twice), New Brunswick, Plainfield (twice), Elizabeth (twice) and Hoboken. They were in Hoboken for about 4 years, living at 104 River Street. 104 River St., Hoboken - the right photo was taken after the Blizzard of 88. Stevens Institute can be seen in the far background. 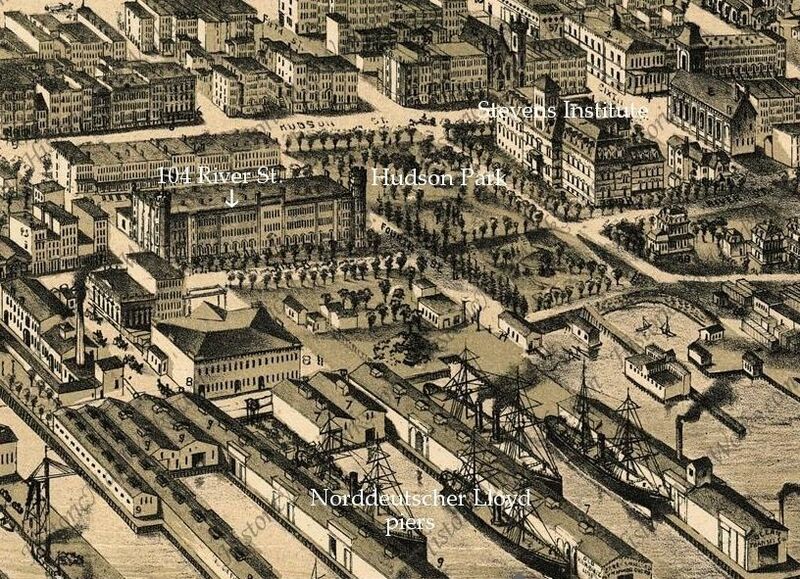 Below is an 1881 bird's-eye view of Hoboken from the Hudson River. The Smiths moved there four years later, but little had changed by then. The photos below that show the Norddeutscher Lloyd shipping company pier for Bremen immigrant arrivals taken from an upstairs window of the Smith house. There are a few differences between them, the one on the left being older. Many European immigrants were brought here and then ferried to Castle Garden in Manhattan before Ellis Island opened. The ships in the photos below were not the large steamships on which they would have come. 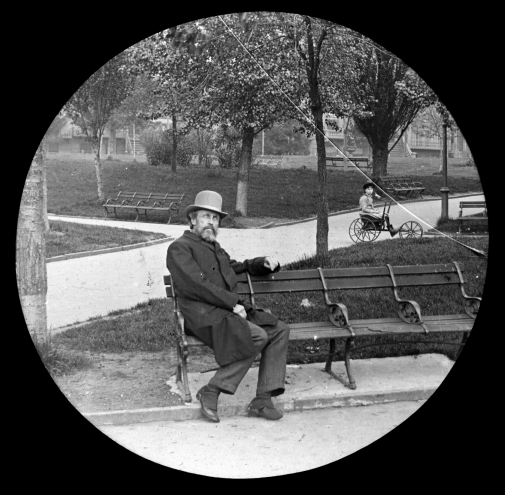 The last photo shows George sitting in Hudson Park and Gertrude riding her comfortable looking vehicle nearby. 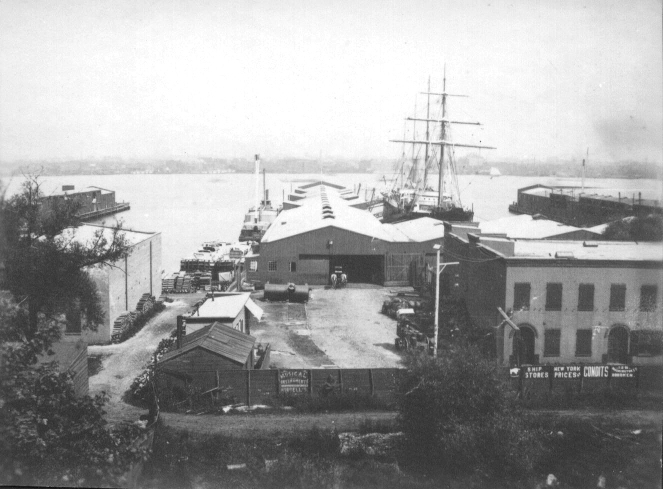 All of the 19th century houses within two blocks of the riverfront have been replaced by large, modern apartment complexes, and the piers are gone. Part of Hudson Park and Stevens Institute are all that the Smiths would recognize today. The family settled for a time in Montclair, New Jersey. They were first at 46 Union Street in 1896 before moving to a very spacious house at the corner of South Fullerton Avenue and Union Street. The last move for George and Anna was to "Drumconnell Farm," the home of their daughter Gertrude and her family in Dundee/Lakemont, NY. They died there within eight months of each other in 1911. Summers were a very active time for the family. George purchased land on Kimball�s Island, Maine, in the 1890s and began a tradition of summers there for many of his descendants. 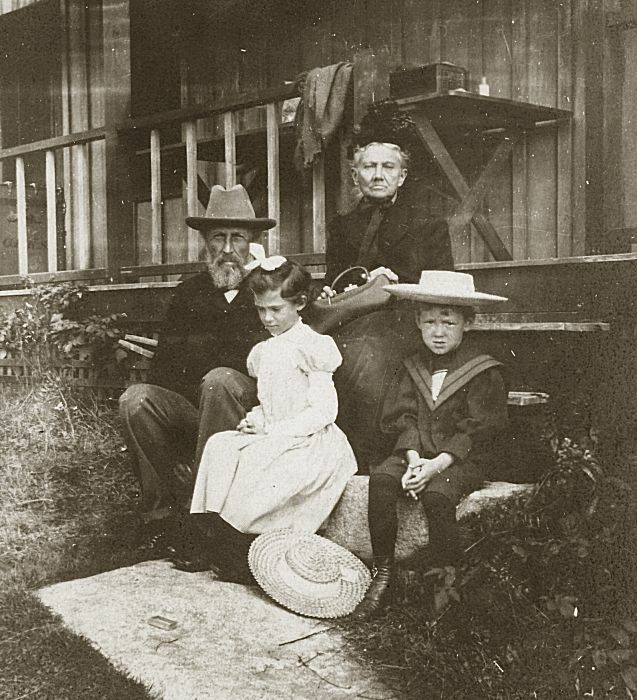 Smith family on Cape Cod, 5 Aug 1885. Oscar, second from left, can be seen pulling the trigger for the camera. sources for vital records: Birth, death and marriage dates came from notes by Stanton M. Smith and Gertrude S. Wister. His marriage was reported in the 14 June 1861 issue of The Cincinnati Gazette, p. 3. George and Anna's deaths were reported in The Penn Yan Democrat, a local newspaper.